Like a Potato... I Have Many Eyes, originally uploaded by Misty DawnS. I'm still going through my archived photographs, which is actually kind of fun. I get to rediscover some photographs which I initially passed over, and I get to see how I've progressed with my photography. For example, this photograph is from when I first got my DSLR (Sony a350). I was, obviously, still learning about things such as depth of field, which is why the background in this photograph is too busy. Since then, I've learned how to use depth of field to help me focus on the subject and blur the background. Regardless, I like this photograph, because this is a butterfly (Wood Nymph), which I don't have many photographs of... busy background or not. Also, this is a "first" for me photographing this species of butterfly. So, it's a keeper, in my opinion! 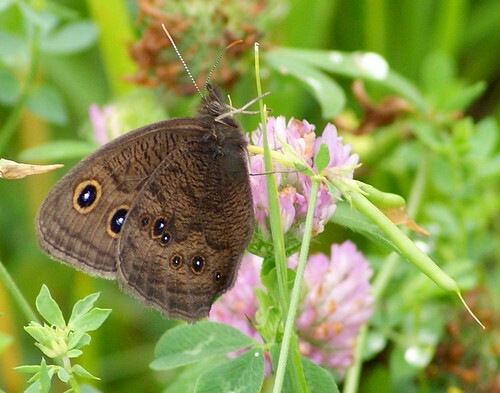 Besides, it has memories, because I can still remember very cautiously (so not to scare it away) climbing through the ditch and weeds to get this butterfly's portrait. I hear you on depth of field...I am still learning also. Still I love this shot! Great job on capturing that photo! Very nice 'keeper' photo of the Great Basin Wood Nymph. Wait, you're in Missouri...maybe it's a Small Wood Nymph. Nope...can't be...too far east. I guess it can only be a Common Wood Nymph. Lovely composition and details. 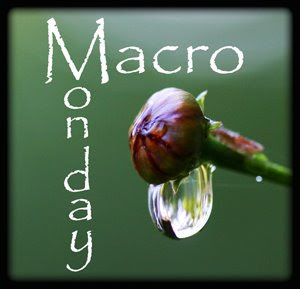 Happy Macro Monday. Your photos are beautiful! Love it... and it doesn't look busy to my untrained eye. I scrolled down and I'm really impressed with your work! Great job. I LOVE it! And I LOVE going thru my archives as well ..... a great thing to do when I can't get out with the camera! It was really excellent post! thanks a lot for sharing..